Author of the Newbery Honor Book The Night Diary! VEERA HIRANANDANI has an MFA in Fiction Writing from Sarah Lawrence College. She has written fiction for both children and adults. 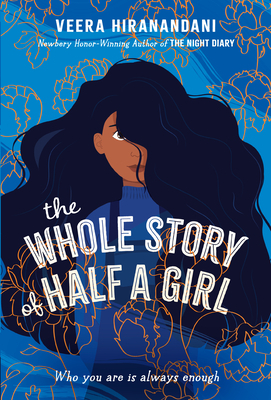 The Whole Story of Half a Girl is her debut novel. "In Hiranandani’s debut novel, Sonia’s struggles are painfully realistic, as she wrestles with how to identify herself, how to cope with her family’s problems, and how to fit in without losing herself. True to life, her problems do not wrap up neatly, but Sonia’s growth is deeply rewarding in this thoughtful and beautifully wrought novel." "Four decades separate Sonia Nadhamuni and Judy Blume’s Margaret Simon, but these feisty, funny offspring of Jewish interfaith marriages are sisters under the skin. Like Blume, Hiranandani resists simplistic, tidy solutions. Each excels in charting the fluctuating discomfort zones of adolescent identity with affectionate humor."